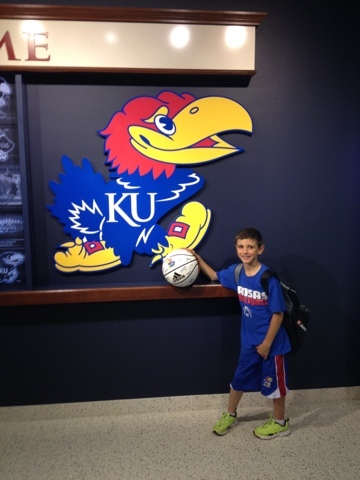 In my house we are huge KU basketball fans, so when we had the opportunity to send Bubs to the Bill Self Basketball Camp, we jumped on it. I'm not sure who was more excited, him or me! As I drive away after dropping off Bubs on the first day, I am extremely nervous. I repeatedly told him how important it is to keep his backpack with him at all times. I tell him that he is responsible for his meds, something he has never had to do before. I pray that he stays safe and be responsible. Each day his backpack will contain his lunch, supper, and snacks, as well as his EpiPen, Benadryl, and inhaler. The medical form I filled out for the camp has all the necessary information, and I notified the medical team about his allergies and asthma upon check-in. But it doesn't seem as if there is any one person in charge that I can inform. It makes me really nervous that if something happens, no one will know what to do. There is a lot of downtime during the day for the boys to rest and hangout, and I don't think there's much supervision during that time. Bubs knows not to take food from anyone, but that doesn't guarantee his safety. I'm a nervous wreck. I've talked to him about keeping his backpack with him at all times and to keep it out of direct sunlight since his meds are in there. I hope he doesn't get so distracted by the excitement of the camp that he leaves it behind. I pick him up the first night and ask how things went, including supper. He says he felt left out. Oh no! I ask if it was because of his food, and he says no. He just didn't know anybody since it was so early in the camp. Whew! I never want him to feel left out because he is eating something different. So far so good on that front. I tell him he will make friends as the camp goes on. The next three days he is at camp all day (over 12 hours!) There is a lot of downtime midday for lunch and rest. When I pick him up the second evening he says he felt left out during the downtime due to the other kids buying and eating candy (of course with chocolate, peanut butter, etc.) He just doesn't want to hang out them because they are messy and he doesn't want it to get on him by accident. He says there are M&M's, chips, and smears of chocolate around the boys, so he wanders around looking for something else to do. 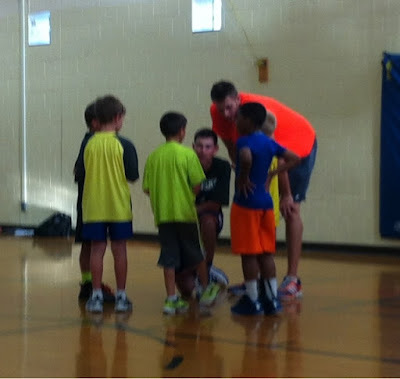 He says he doesn't want to go back the next day because he was lonely during this particular part of the day, even though he loves the basketball part of it. He also says he didn't eat all of his meal because the other kids are eating ice cream at his table and it melts and makes a mess. So he just gets up and leaves without finishing his food. This poor kid is so careful and paranoid (rightfully so) about being around his allergens. But it causes him feelings of isolation from the other boys and loneliness. I want him to be aware of his surroundings and his safety, but I also don't want him to be isolated or feel like he needs to leave social situations. I'm not sure what the answer is to remedy this situation, so I just talk with him about ways to hang out with the other boys safely. I tell him that he can still hang out with the kids who are eating candy (since I sent snacks for him as well--so he wouldn't feel left out when the others were snacking), he just can't eat it himself. But he is worried about contact, and he does have contact reactions with his allergens. Luckily, he loves the camp enough that he decides he wants to go back each day, even though he has to deal with the down time. I send books and a deck of cards for him to entertain himself, but I think he found a friend who wasn't snacking on candy to hang out with. All in all, it was a good experience, for both of us. This is the first time I have sent him out of our little bubble of daycare and school. And guess what....he survived without a single reaction! I'd call it a success on the food front, but we have some work to do on the social front. How do you handle social situations where others are eating (and leaving a trail) of your child's allergen when you are not there to monitor? This is the first of many situations we will learn from. 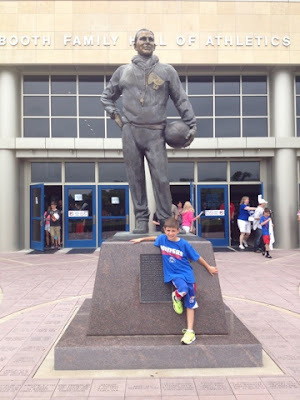 Bubs has a new appreciation for KU basketball. He is now a die-hard fan. He got autographs of this year's team as well as some alumni and Coach Self. We are both eager for the season to start this fall.